We awoke early to join other morning birds for the first entry of the day at Barcelona’s famous church, consecrated as a minor basilica only in 2010, and of course a UNESCO Heritage Site. Inside, just a few dozen of us had the space to ourselves, the sunlight creating its own music to accompany the Gregorian chants drifting through the church. Sagrada Familia was designed specifically not to have an organ; Guadi preferred the church be filled with the sounds of people. The Nativity Facade of Sagrada Familia is perhaps the most well-known. In the center of the old, medieval quarter of Barcelona is its cathedral. No lines or fees to enter, no tour buses disgorging mindless camera clickers, just a snappy guard rejecting visitors who were not properly dressed to enter an active house of worship. The lighting in this cathedral was appropriately theatrical. Gregorian chants were not necessary to feel transported in time here. The church is dedicated to Eulalia of Barcelona, its patron saint, who at the age of 13 suffered martyrdom during Roman times. 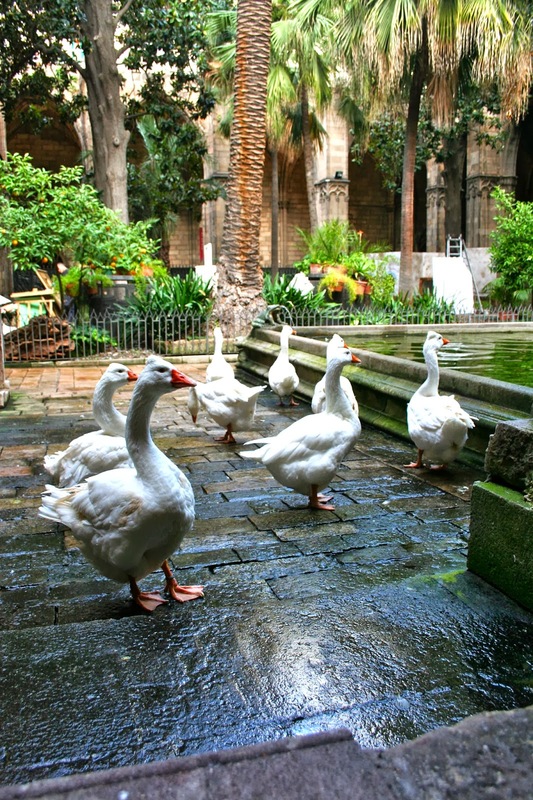 In the cloister of the church roam 13 white geese, in her memory. Lines, or no lines, visiting the Barcelona Cathedral and Sagrada Familia are highlights of our holiday.